The life and times of German-born American architect Adolf Cluss came to life in the exhibition, Adolf Cluss: From Germany to America, Shaping a Capital City Worthy of a Republic. 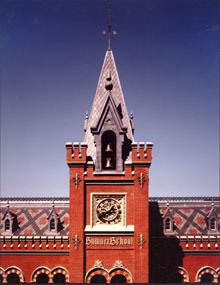 The exhibition highlighted many of Washington's most prominent buildings of the post-Civil War era--and the few that survive, including Franklin and Sumner schools, the city's old Masonic Temple, Calvary Baptist Church, and the first National Museum, now Smithsonian's Arts & Industries building. The exhibition went beyond architecture and historic preservation to issues that echo contemporary concerns: district government, public education, public works, immigration, and urban planning. Located in Washington, DC's Charles Sumner School Museum, one of Cluss's extant buildings, the exhibition considered the origins and character of Cluss's vision for the capital of a democracy. The Adolf Cluss Exhibition has now closed. However, you can still make a virtual visit! Also, the sections dealing with public and private education in Washington remain on view as a permanent exhibition at the Charles Sumner School Museum. Please click here for the virtual exhibition gallery.